She is a fitness instructor herself. One would wonder why would a fitness trainer need a fitness tracker? But, this fitness trainer wanted a tracker that would help her know how many steps she takes in a day and also wanted a motivating factor in a coach with whom she could interact and understand more on nutrition etc. Let us understand from Nyela Saeed in her own words what is it that she has learnt and implemented for her ownself? 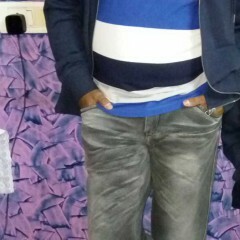 I am a fitness instructor by profession and I run various classes of aerobics, Bollywood workout etc. 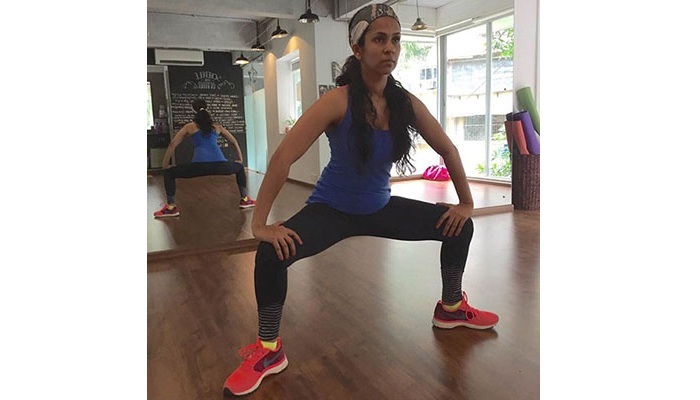 and I am trained with Reebok and have done many other short courses in fitness. 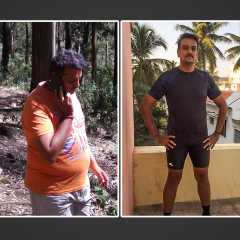 I was gifted a GOQii fitness band a year back for my birthday by my husband. I have been with it for a year and I have been extremely regular with my login and my meals but the reason I have actually got the band is because even though I am a fitness instructor and I am conscious in many ways just having a band on your self tells you how many steps you took and having a coach who is constantly watching over you is an important key feature that works for me. I have a daily routine that starts with the workout classes in the morning and I am extremely busy through the day. I also have a three year old baby who I attend to and therefore end up paying less attention to myself. Initially, I didn’t really know what GOQii was about, I knew that there are fitness bands in the market that measures your heart rate and track your step count etc. but I didn’t know GOQii existed and it comes with a live coach. When I got the band and synced with the app, I understood that this is not a robotic application its real who understands my needs and works accordingly. 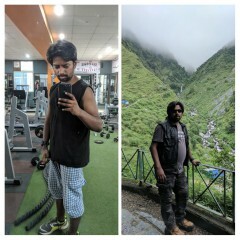 I didn’t have any particular health goal because I am a fitness trainer myself. Despite the fact that fitness is something that has always been of interest to me, I still wasn’t paying a lot of attention to myself. I wasn’t paying a lot of attention to my sleep cycle. I wasn’t eating mid meals at all earlier and I would get extremely hungry and eat a big supper. Now all of this is corrected thanks to my coach and also I make sure I meet my water intake level of three litres per day. Other than this I get a lots of tips from my coach and I don’t have to keep googling to get my questions answered. For e.g. the cooking oil that you use in the house. I always go and buy the same cooking oil from the same bottle. The way my coach has explained to me what is poly saturated and mono saturated fats and how to alternate your oils etc. these are the things you need somebody to personally tell you how to incorporate in your life. Also lot of questions pertaining to nutrition, I now just ask my coach and take her word for it. She also, put me on a three to four days detox regime in between because I had a long wedding period. My wrong sleep patterns have come down drastically because of my coach. Sometimes I used to have my meal and then have chocolate cravings. My coach has taught me to alter my meals and now after my meals I have flavoured saunf or jaggary and peanut bar. My meals are now only healthy choices and I have given up on white sugar for the last one year.That is a big thing for me. I only take jaggary for everything but my coach has told me not to go overboard with it. Recently, I have also been away from tea and coffee not because my coach told me but because I have become more conscious. Tips on nutrition is what I was largely looking for and my concepts are now clear. Apart from my health, my baby’s nutrition is also taken care of. Earlier I would workout 5 days a week, my coach suggested I add one more day of workout and have only one day for rest.I have stopped taking the car or an auto and instead walk to places that that has helped me reach my target step count. My water intake has always been good. 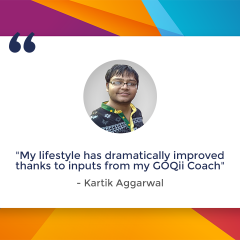 All in all I am happy being on GOQii platform and it has helped me a lot. What does coach Tejal Gupte have to say about Nyela Saeed? Nyela has been on her GOQii health journey for more than a year now. She has always been a cheerful and an enthusiastic person, always ready to learn more and new things about health and nutrition. Coming from a fitness background, staying physically active was never a big challenge for her. But, her lifestyle consisted of high frequency of eating out due to frequent socialization and she had been a sugar addict for a long time. So we took these two aspects as our short term goals one after another. We regularly discussed ways to practice mindful eating when having outside food and importance of portion control in such situations was explained and imbibed in her routine. Dealing with the sugar cravings looked challenging and took time initially. Right from using healthy substitutes i.e jaggery based sweets, dates and fruits, to the distraction techniques like engaging in favorite activity, consuming saunf at the time of craving, and other tips were shared and incorporated. I must say, even though it was not easy for Nyela to go off sugar that easily, it was her determination and hard work that helped us to achieve these goals. She even participated and to her surprise finished the 7 days sugar free challenge. She also completed some other challenges like the “3 day detox challenge” and step count challenge.During the whole year, we also worked successfully on some other goals like water intake and adding healthy snacks in evening to beat the hunger pangs. Nyela has been regularly syncing her band, sending her updates as well as interacting on her goals throughout, which has made it more helpful to work on her goals.In the current scenario, her water intake has improved a lot than earlier. Best part is that although we could not do much alteration in her frequency of eating out due to her highly social lifestyle, mindful eating has almost become a habit for her and she is able to master it most of the times. I feel really happy and proud to see the transformation she has brought in herself in this one year period. Love her as a coach she’s the best ? ?